That "crowfoot" outlet is what we use in Australia. See here. May 12, 2018 at 06:38 AM Author: Cole D.
Cool, here I think they were used as a very early grounding receptacle for washing machines or other equipment that had to be grounded. 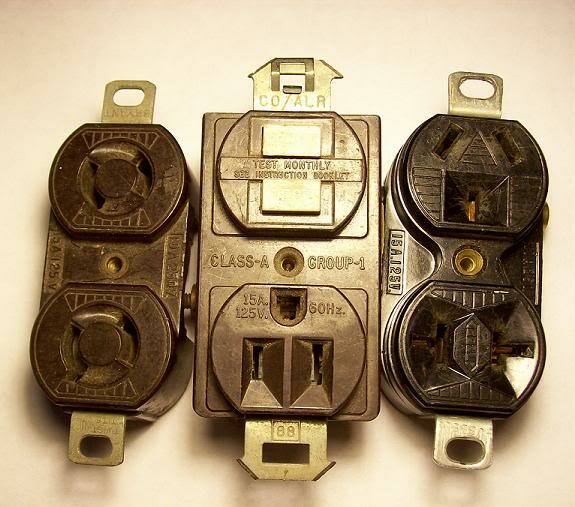 This was before the more modern U-ground outlets we have today. Wow! Never seen a GFCI that uses a duplex receptacle plate! Must be a very early GFCI? Yeah same here interesting that the text on the button is oriented for a ground up installation. The others two are pretty rare too, never seen a two prong twist lock before either. May 13, 2018 at 02:27 PM Author: Cole D.
I'm not sure how old the GFCI is, but I know they made these in the late 70s/early 80s. I'm pretty sure Square D made them. As far as I know, Pass and Seymour made the first GFCI outlets in 1971, and they fit a standard "decorator" plate. The outlets on them were turned to the side instead of the typical up/down style. I have a GE that's similarly designed I'll post later. Leviton's first GFCIs in the 70s were like that too, the current Leviton style came out in 1985. I don't know if you've ever seen Eagle/Cooper's older GFCIs but they also had the sideways outlets and they made them the longest, throughout the 90s and up to about 2002. Also, wanted to add all of these plus others came from my Habitat electrical area. I've found some really interesting pieces there as far as wiring devices. My grandma's house's receptacles are all of the far right type, but with both halves of the duplex being like the bottom portion. Those plugs are crazy! They're 15A 120V, 20A 120V, 15A 240V, and 20A 240V! And the ones in her house are so worn that the neutral and hot slots are the same size. Further, some are wired backwards and some are installed upside down so it's a coin toss on whether or not polarity is correct. She and my aunt don't want to to change the plugs out though, saying it's "too much work". I did change the two in the kitchen though, so they're grounded and GFCI protected. Feb 10, 2019 at 07:57 PM Author: Cole D.
I just saw at Habitat one of those brown outlets with the T-slots but one has the outlet and the other is a switch. I plan to get it. My Habitat has about 4 bins of old electrical, switches, outlets, breakers and cover plates for 50 cents each. A lot of it is blah Leviton duplexes and toggles or rockers in ivory or white. But they also tend to get in a lot of more interesting stuff that's brown or ungrounded. And they don't seem to throw away anything they get. There are currently a lot of old Slater GFCIs in a bin, but they're in such poor condition (painted, rusted) that I'm embarrassed to buy them for my collection. Most of my stuff in the gallery came from Habitat, by the way. Including all three in the picture. My local ReStore has/had bins of vintage plates and devices too. I had searched through the bins for any "hard snap" toggle switches but couldn't find any. I like those and the mercury switches the best.